I’m up early this morning for a final breakfast at Café Delmas. I gather up my things and pull my suitcase behind me across the cobblestones, past Hemingway’s apartment on the Rue du Cardinal Lemoine, down the Rue Mouffetard to Place Monge. I ride to Gare du Nord in the back seat of a cab driven by a man I quickly dub “Monsieur Lazy Pants.” He is tall and wiry with close cut hair and faded jeans and he shrugs as he explains how he likes to come to the Place Monge taxi stand because there’s usually no one there. Let’s just say he’s not France’s most enterprising driver. His English consists almost entirely of “I am sorry, but I need it,” a phrase that he applies liberally to both coffee and hand-rolled cigarettes, despite a prominent no-smoking sign on the inside window of the car. 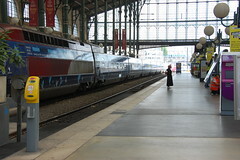 Really, it’s a miracle that I arrive on time to catch the Thalys train to Belgium. As we pull out of the station, I take a final look back at the city, which is—at last—bathed in sunlight. It’s a shame, truly, because the weather report is calling for persistent rain in Bruges. Storm clouds are following me everywhere I go. The journey to Brussels, and then on to Bruges, is an easy one, but most of the day is filled with minor details—departure boards and waiting rooms. Nevertheless, it gives me the chance to recharge after a hectic schedule in France, both in and out of Paris. By 1:30 I’ve arrived at the Hotel Patritius, a small family-run place on a street named Riddersstraat, a name crowded with so many redundant letters I feel like I’m stuttering when I read it out loud for the cab driver. Belgium has three official languages: Dutch, French, and German. 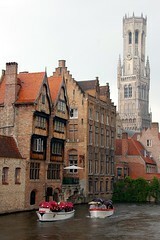 As I understand it, English is also widely spoken, especially in tourist meccas like Bruges. My guidebook advises me to say goeiedag in Dutch, but I fear mispronouncing that (with good reason), so I decide to approach the woman at the front desk of the hotel with a cheery bon jour, followed by hello, hoping to cover a sufficient number of bases. The strategy doesn’t work. She bristles visibly, sighs, then explains in English that Belgians in the Flemish north do not speak French. Ever. I hang my head in shame, all the way up the stairs to my room. 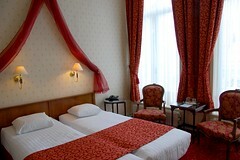 It’s a nice room, with lovely tall ceilings, but it’s a bit strange, too. The bathroom has a giant picture window to the right of the tub which looks out onto the room itself. I suppose it’s there to let in natural light, and I am traveling solo after all, but still I feel oddly exposed, and opt to pull down the shade. By the time I unpack and make my way back downstairs, the woman at the front desk has been replaced by a kinder, gentler man. He gives me a map of the city and a suggestion for lunch. It’s a large map on thin paper and it folds into so small a rectangle that opening and closely it successfully feels like a frustrating lesson in Origami. It’s also impractical to use on a rainy day while holding an umbrella. On my way to Souffleur, a gust of wet wind catches it and I struggle to fold it back into shape, but I find my destination at last and enjoy a warm bacon salad with croutons, pine nuts, goat cheese, and apple. 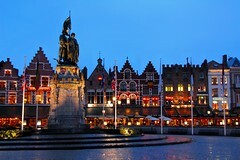 Afterwards, I venture out into the city proper, to the Burg and the Grote Markt and the shops in between. It’s raining steadily now and when I reach the bridge where Dijver meets Rozenhoedkaai, I snap a picture of the belfry rising from the mist with a canal boat passing underneath, filled to the brim with day trippers huddled beneath their umbrellas. It’s a sorry sight. It’s at some point after this that I do what I hoped never to do. I resort to using the little rain bonnet stashed away in my camera bag. I’m becoming my grandmother. Can it get much worse? Maybe it can. For a moment, I actually think it’s snowing down near Minnewater when I see the white down feathers on the ground from all the swans. 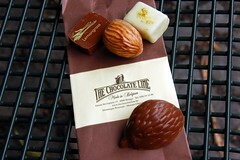 It’s time for the salvation of chocolate. I’m beginning to feel like Monsieur Lazy Pants. I’m sorry, but I need it. Preemptive research tells me that The Chocolate Line is an excellent destination, so I make haste and buy a small bag full of some truly unusual flavors, including lavender and lemongrass. The young woman behind the counter clearly thinks I look ridiculous in a rain bonnet, but I can’t say that I blame her. At least she does her best to hide a laugh. 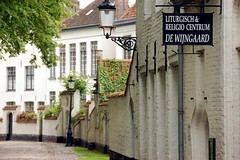 Disconsolate, I trudge on to the Begijnhof, a convent for Benedictine nuns. It’s a quiet place, where all I can hear are the raindrops falling onto a canopy of green leaves. 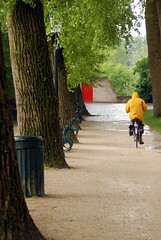 The trees are all slanted in one direction, as if Bruges is forced to endure this kind of weather all the time. Quite by accident—or rather serendipity—I stumble across a small church with an open door. The nuns are preparing to sing vespers in Gregorian chant. I enter cautiously at first, not sure if I’ll be welcome, but an ancient woman with a kindly face smiles and motions for me to come forward and sit. I do, and allow the music to wash over me. After a cozy dinner of chicken souvlaki at The Olive Tree, I grab my tripod and head out into the rain to take some night shots, intending to make the most of the wet reflections on the cobblestone streets. As I stand in the center of the Grote Markt, soaking wet, it occurs to me that one year ago today, I was in Venice sitting under the stars, sipping a Bellini in St. Mark’s Square. I’ve been thinking a lot about Italy since that exhibit at the Musée d’Orsay in Paris and I’ve really got to stop. I’m so distracted by both the past and the present that it doesn’t yet register that the expensive zoom lens on my camera isn’t focusing properly, but it will. In the morning, it will.